Patrick is a partner in the Miles office of Fox & Rynne. He was raised in Miles and commenced in the Miles office in 1983. He supervises an office with nine supporting staff, including two accountants. Patrick lives on a rural property with his wife Melody. Megan joined Fox & Rynne as a graduate Accountant in 1992. She completed her CPA in 1995. She currently works part time since starting her family. Megan is also involved in a family business in Condamine. Janine moved from Germany in 2011, and is now married to local farmer Josh. She joined Fox & Rynne in 2012, and completed her CPA in 2017. Leanne joined Fox & Rynne in 2004. She currently lives in Dulacca with her husband and two sons. Leanne helps her husband with their contract harvesting business. Nicole has recently joined our team as a bookkeeper. She lives in Dulacca with her husband Shayne and four children. Joined Fox & Rynne in December 2017. She currently lives between Chinchilla and Miles on a property with her husband Darryl. Has been working at Fox & Rynne since 1994. Relocated back to Miles in 2018 with husband Robert and two children. 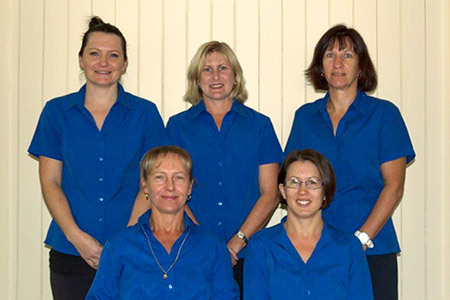 Taroom Office Staff: (Back L to R) Rebecca Fitzpatrick, Alison Hay, Vikki Lamb. (Front) Claire Waters, Tina Hay. Alison has worked for Fox & Rynne since June 1995. Prior to this she had five years of service with Westpac Banking Corporation, and five years of service in the accountancy field. Alison has had experience in the primary production industry, and currently helps her husband Trevor run the family property at Taroom. They have three children. Claire joined Fox & Rynne in 2003 after moving to Taroom. She completed her Bachelor of Business Degrees with Distinction studying externally whilst working in Dalby. She was admitted as a Certified Practicing Accountant (CPA) in 2001 and specialised in Self Managed Superannuation Funds and Primary Production. Claire assists in the management of a beef cattle property with husband Terry and enjoys playing Polocrosse. Claire has two children. Tina joined Fox & Rynne in August 1998. Tina is a very experienced bookkeeper, and has an extensive knowledge of numerous accounting software programs. Tina lives in Taroom with her husband Stuart and two daughters, where she also helps run their family property. Vikki started working for Fox & Rynne in July 1999. Vikki has had vast experience in bookkeeping and administration. Vikki lives with her husband Warren and son.